We actually counted: Founders of Gloomhaven contains 335 tokens, 139 tiles and 83 cards. Which amounts to no less than 557 small parts! We recommend to take good care of them, or else those 557 small parts might soon become 556 small parts. The question is only: How exactly do you make sure your claim tokens don’t get lost in the chinks of your sofa between peanuts and chips? How will you prevent your prestige tiles from disappearing in your backpack, possibly wedged in between forgotten bananas. An Organizer Made Of Foam – For Sure! 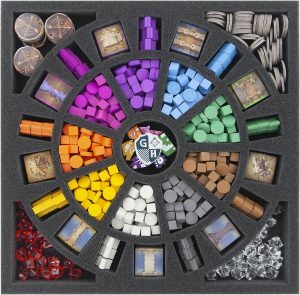 When Founders of Gloomhaven fell into our hands, we were wondering: How do we manage to design an Organizer made of light-weight foam which still provides the necessary stability. Our solution: Make the foam a bit denser than the one we usually use. This way, our Organizer will still be as light as a feather, yet capable of supporting the game’s rather heavy-weight content. Of course, in contrast to wood-based sorters, our foam-based Organizer comes ready to use without the need to assemble anything. This saves you lots of time which you can use for, well, things that are more fun. The Organizer fits exactly into the original game box. This allows you to store your game materials in a space-saving manner, without having to clear additional room on your shelf. When you’ve placed the Organizer and the game boards into the game box, the lid of the box will extend only slightly over the edge. This makes sure that the lid doesn’t slip off the box during transport – ensuring that the contents stay where they belong. Say It Already! What Does The Organizer Contain? In short: Two custom cut foam trays and one matching foam topper. 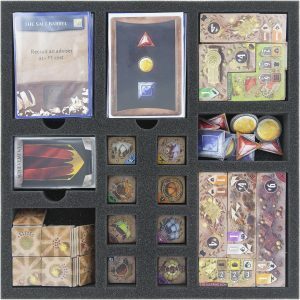 The first tray has 15 compartments and will hold (sleeved) cards, tiles, trade stalls and other small game components. The three compartments for the cards feature finger-thick recesses for easy take-out. The second tray features 32 compartments. These will provide space for all claim- and delivery tokens as well as the Bridge/Gate-Tiles which can be sensibly sorted by color. 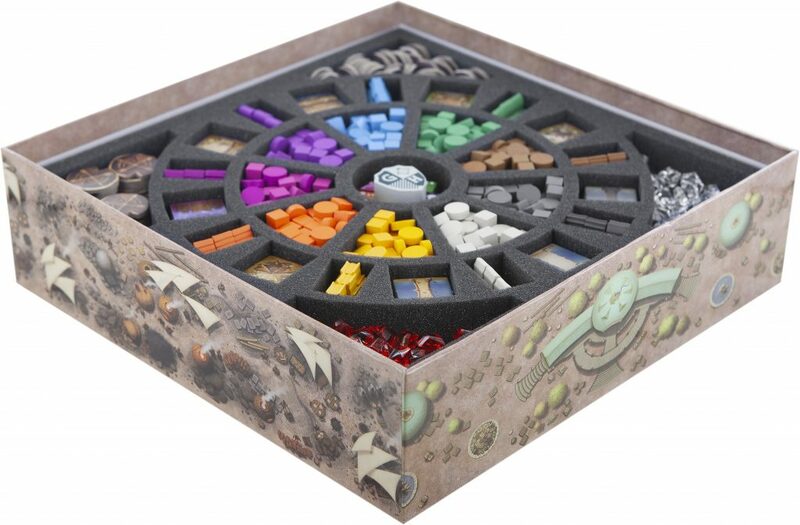 In addition, the tray has compartments for influence- and money tokens, worker pawns and the active player token. When you’re done sorting everything into the Organizer, just lay the foam topper on the upper tray so that nothing can fall out. Finally, place the larger game materials – Game Board, Advisory Board, etc. – on top, close the lid and you’re all set for the construction of a great city. Satisfied Or Not? Let Us Know! Do you have any Remarks, Suggestions or Critique regarding our Organizer for Founders of Gloomhaven? Let us know via e-mail or write on our Facebook page.